Here is a list of our 2012 vendors. You'll notice many new names as well as some returning favorites. Please come out this Friday and support the market! Musical Guest: Erik Boedetker and Johnny O. It's going to be a great season! See you this Friday from 4-7 PM. Our first market of the season is this Friday from 4-7 PM. New vendors, returning favorites and lots of wonderful, local produce! Please note that the farmers give us these lists in advance. Due to weather or other issues, some items may not be available. We ask for your understanding. Come early for best selection! Live music from 4-6 PM this week by Erik Boedetker and Johnny O. This guitar/banjo duo typically plays Browns Tavern every Sunday from 6 - 9PM and with Jason Cann at Harpoon during his second set. Don't forget to stop by the manager's booth to buy one of our lovely market tote bags. It's a wonderful way to carry your local produce home. We hope to see you at Hartland Farm Fest on Sunday from 11-3. Please stop by the Hartland Farmers' Market booth and say hello. 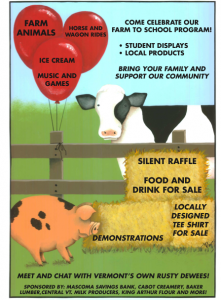 Don't forget to mark your calendars for Hartland Farm Fest. This wonderful, family-friendly event will be here before you know it. Be sure to stop by the Hartland Farmer's Market booth to check out our new tote bags, learn more about our 2012 vendors or see the tentative music schedule for the 2012 season.